I’m a conservative Latina. Is there a place for me in Trump’s Republican Party after Charlottesville? These are strange times to be a conservative Mexican-American. I do not see myself as a person with one foot in the United States and one foot in Mexico. A large portion of my family are Tejanos, people who lived in Texas when it was a part of Mexico, and those of us who did cross the border have been here for generations. It is as a Catholic Latina and a student of conservative politics that I am now torn between two worlds. Since the election of Donald J. Trump, I have seen the indignities endured by my fellow Latinos. My brother and his friend had trash thrown at them on the road by white men who yelled racial slurs and told them to “keep curfew.” My sister was hit with a shopping cart at a grocery store by a white woman who wanted to look at an item on a shelf. When my sister stayed put, the woman mocked her in pidgin English, saying “You don’t speak English?” My cousin, who was born here, was pulled over in his truck, not because he was driving in any suspicious way but because the officer wanted to ask him if he is legal or not—a perfectly legal stop under Texas’s recently passed State Bill 4. Since the election of Donald J. Trump, I have seen the indignities endured by my fellow Latinos. The Unite the Right rally in Charlottesville, Va., on Aug. 11 and 12 showed the nation what many minorities have personally attested to, only to be met with disbelief and dismissal: Racism is alive and well, and it is deeply entrenched in conservative politics. At the gathering, the former Ku Klux Klan leader David Duke said: “We are going to fulfill the promises of Donald Trump. That’s what we believed in. That’s why we voted for Donald Trump, because he said he’s going to take our country back.” The president, who has little trouble denouncing his “enemies” in the media and Congress, struggled to immediately and unequivocally disavow neo-Nazis and white supremacists. Hearing Mr. Duke’s words, I remembered the shudder I felt watching Mr. Trump during the presidential campaign as he articulated his platform, particularly his immigration policy, in terms of “taking our country back” and “making America great again.” Watching the violence in Charlottesville unfold, I recalled my sympathy with the thousands of protesters who took to the streets after Donald Trump’s inauguration with chants of “Not my president.” Though I did not march, I know the fear and despair expressed by many Americans, especially immigrants and people of color, over our country’s inability to take seriously the persistent problems of racism. I understand the conservative Trump supporter who is not motivated by racial animus. At the same time, I understand the conservative Trump supporter who is not motivated by racial animus. I understand the frustration of feeling unfairly blamed for the detestable behavior of those who happened to support the same candidate. But in the face of an emboldened white supremacy movement, I find the defensive posture of some conservatives more and more trying. Having known and seen family members bear the humiliations of racism, it is hard to accept the alliance Republicans made in 2016 with Donald Trump and to watch the way that compromise has poisoned the discourse on immigration policy. As the evidence of some connection between President Trump and racism mounts and reports of hostility to minorities continue, Republican voters who I once considered my political allies remain indifferent or incredulous. Perhaps because they themselves did not vote for racist or anti-immigrant reasons, it is difficult for them to imagine that others have done that. Still, it is important for conservatives to confront racism in our ranks and to question our unsavory political alliances, rather than to minimize or deny the rise of racism under President Trump. Only then can we engage constructively in debates over immigration policy. Indeed, conservatives, who consider themselves students of the Western tradition of justice, can bring to these discussions compelling questions about what we as a nation owe undocumented immigrants. What constitutes just treatment toward laborers who have built up our communities and contributed to the fabric of the United States? What constitutes fairness toward the labor families, often comprised of citizen children and undocumented parents, who are being torn apart under an immigration policy that has vacillated over the decades between terms of cooperation and paths to citizenship to talk of mass deportations? These are the questions conservatives should be asking about immigration policy, but the American right grows less and less able to express ourselves in these terms. During his campaign Donald Trump characterized illegal Mexican immigrants as the refuse of Mexican society, claiming that they are “bringing drugs...bringing crime.” They are “rapists,” he infamously said. Mr. Trump later clarified that he was only drawing attention to the portion of illegal immigrants who commit serious crimes—a notably small percentage of the illegal immigrant population. These “bad hombres,” we were told, would be the targets in any deportation roundup under the Trump administration. The reality on the ground already looks quite different. The deported include many who are guilty of offenses related to their illegal status but not of the violent crimes Mr. Trump warned of. In February, Guadalupe García de Rayos, a 35-year-old mother of two citizen children who has lived in the United States for 20 years, was deported to Nogales, Mexico, for using a false Social Security number and living in the country illegally. Maribel Trujillo Díaz, a mother of four citizen children in Fairfield, Ohio, was deported to Michoacán, Mexico, in April. She has no criminal record and under the Obama administration was able to work and remain in the country so long as she checked in with Immigration and Customs Enforcement once a year. In 2008, Jesús Lara López came to immigration officials’ attention when he was caught driving without a license, but he was permitted to continue living and working in the country. In July, the father of four American children was deported to Mexico. In the face of an emboldened white supremacy movement, I find the defensive posture of some conservatives more and more trying. The fact is that while Mr. Trump has promised to deport two to three million people, there are not even two million illegal immigrants with criminal records to be deported. President Trump’s rhetoric around immigration and enforcement actions have at best underestimated the challenges posed by immigration. At worst, he has contributed to a dangerous climate of racism and xenophobia. At Texas State University in San Marcos, Tex., where I teach, students were spat upon following President Trump’s election; some had their hair pulled, and others were told to “go back to Mexico.” There have been anti-Semitic and white supremacist fliers distributed on the campus four times since Mr. Trump’s election. Other fliers encouraged students to report undocumented immigrants to federal authorities. At a university where minorities make up 50 percent of the student population, these flyers sent a clear message: You are not welcome here. Racially driven opposition to immigration among conservatives did not begin with Donald Trump. The late political scientist Samuel P. Huntington, though himself a lifelong Democrat, championed views on the dangers of large-scale Latino immigration that have been embraced by many on the right. In his book Who Are We? The Challenges to American National Identity (2004), he drew a firm boundary between the cultural resources of Latinos and the American experiment: “There is only the American dream created by an Anglo-Protestant society. Mexican Americans will share in that dream and in that society only if they dream in English.” For Mr. Huntington and like-minded conservatives, Latinos not only need to learn how to read, write and speak English to succeed in the United States; they must aspire to act like white Protestants. It is a disturbing call for ethnonationalism and a poor interpretation of the Declaration of Independence’s revolutionary (if aspirational) claim that all are created equal. At a more grass-roots level, the radio host Rush Limbaugh famously characterized the Mexican-American population as underperforming and lazy and warned the Republican Party against assimilating them. “The way the Republicans are looking at it is that they think that Hispanic immigrants are made-to-order conservatives,” he said. “For some reason, culturally, they think that they’re invested in hard work.” The implication, of course, is that they are not. I have heard similar sentiments expressed by my peers. At an academic conference I once attended, a presenter spoke about how Latinos pose a threat to “American identity” because they have a culture of “handouts” and a love for “authoritarianism.” I had to leave the room in quiet tears. Racially driven opposition to immigration among conservatives did not begin with Donald Trump. How widespread are these beliefs among voters? The research paints a complicated picture. A Pew Research study published in August 2016 found that while only one-third of Trump supporters believe undocumented immigrants are “less hardworking and honest than U.S. citizens,” 50 percent thought illegal immigrants are “more likely to commit serious crimes than citizens.” The majority of Republican primary voters did not support the mass deportations of illegal immigrants (though 52 percent of those who initially backed Trump for the nomination did). Another study found that 56 percent of Republicans support a path to legal status for undocumented immigrants. Other studies, however, have shown that there are hidden biases against immigrants from Mexico that complicate the debate about Latino immigration, in particular. In one study, researchers asked U.S. citizens how they felt about specific behaviors among immigrants, like overstaying a visa, accepting under-the-table pay and flying one’s native flag. They found that white Americans found these actions to be more offensive when the person in question was originally from Mexico, as opposed to the United Kingdom or Canada. There are hidden biases against immigrants from Mexico that complicate the debate about Latino immigration. It is painful for me to read these characterizations of Mexicans by some on the right. After all, I think of my family as a part of what makes America great. When I hear some members of the Republican Party calling Mexicans “lazy,” I think of my grandfather, who used to have to eat in kitchens away from white people at restaurants, even though he and his brothers fought for our country overseas. When I hear about the mythical greatness of an American dream unsullied by Latino immigration, I think of family stories of citizen children who were told to sit in the back of the school bus by the white school bus driver and how they persisted in their efforts to attain their goal of receiving an education. It was my parents’ insistence on devotion to family and their belief in the opportunity of education that drew me to conservativism. In college, a time when many young people begin to explore the political left, I found myself drawn to conservative ideas. I saw the Western tradition as a transmitter of wisdom from generation to generation, a fertile intellectual soil for Americans confronting important political and philosophical questions. I viewed the conservative account of the family as the fundamental unit of society as an echo of my experience growing up in a multigenerational home, and the conservative account of marriage was the most accurate portrayal of the kind of committed love I longed for. It was my parents’ insistence on devotion to family and their belief in the opportunity of education that drew me to conservativism. Years later, during my pregnancy as a female academic, I experienced first-hand the benefits of conservative “family values.” My male colleagues not only encouraged my vocation as a mother but supported me in my decision to continue my work at the university. This positive stance toward pregnancy is the fruit of robust philosophical accounts of human dignity and sexual difference, and evidence to me that conservatism is well situated to answer the hard questions that the left has traditionally posed about racial inequality, gender inequality and sexual ethics. This is emblematic of what is best in conservative thought. We have great potential to articulate modern problems in a way that draws on the wisdom of the past, without being chained to the past. We seek to conserve rather than to progress beyond or abandon what previous generations have accomplished. We possess the intellectual resources to distinguish between things as they should be and things as they are. Conservative thinkers—heirs of Plato, Aristotle, Aquinas and Augustine—possess the intellectual precision for the careful dance that is required between liberty and equality in a republic. Many on the right put their heads in the sand rather than confront the United States’ persistent racial sins. But instead of relying on intellectual riches of the conservative tradition to answer the hard questions about race and privilege brought out in the election of 2016, many on the right put their heads in the sand rather than confront the United States’ persistent racial sins. Some parts of the Republican Party have even openly challenged the connection between racism and American history, buying into a nostalgic and ahistoric view of the Civil War. The further we get from the election, the more the Republicans’ decision to rally behind President Trump seems like a mistaken last stand, a flight away from what is best and most noble on the right. But I am not without hope. That is because I think conservatives are well situated to deal with some of the more serious questions concerning race and immigration if they turn toward their roots, which emphasize subsidiarity and the common good. One question I think conservatives can pose well is this: What do we owe, in fairness, to the illegal immigrants who have worked in the United States. Drawing on John Locke’s treatment of labor and property, we might ask what the labor of those who have worked here illegally should merit. The common-law notion of adverse possession or “squatters’ rights”—which recognizes the link between the cultivation of the land and a claim to the ownership of it even in the absence of a legal title—reflects an intuitive understanding that there is some sort of connection between obligation and labor, even when ownership is not involved. Conservatives are well situated to deal with some of the more serious questions concerning race and immigration if they turn toward their roots. There is no doubt that the United States has benefitted from the labor of undocumented immigrants, though the just compensation of this work is an appropriate area for policy debate. According to a 2016 Pew Research Centerstudy on unauthorized immigrants living in the United States, 11.1 million illegal immigrants made up 3.5 percent of the U.S. population and 5 percent of the workforce in 2014, with significant representation in farming and construction occupations. Half of that population had lived in the United States for at least 13 years. There is no doubt that the United States has benefitted from the labor of undocumented immigrants. Historically speaking, we are also in debt to the labor of Mexicans. Beginning in 1942, we relied on Mexican labor that was not fairly compensated until 2008. The Bracero Program contracted temporary workers from Mexico to work on farms and on railroads in the United States in order to keep the country’s economy functioning during World War II. This arrangement was renewed by the federal government in some form until 1964, and the advantages of it redounded more to our national benefit than to the contract workers (as is evident by their delayed compensation). Whether we realize it or not, the labor and contributions of citizen and non-citizen Latinos are woven deeply into the national fabric. Another question I believe conservatives can ask and resolve fairly is what justice requires for the citizen children of illegal laborers. 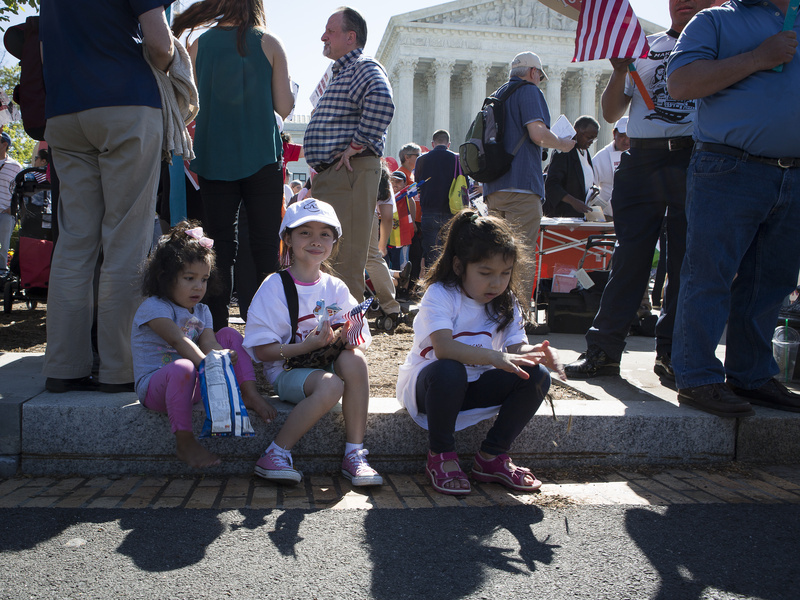 Unlike their parents, who do not have the status of citizens, these children possess all the rights of citizenship and can claim those rights when we are considering what policies that affect the common good. This situation calls for deftness and nuance to balance the demands of border security with the concerns of the vulnerable parties involved; too often, Republican lawmakers are choosing to take a hammer to the entire system, with devastating results for parents and children. This is not in the best tradition of conservatism. Conservative thought recognizes the family is the building block of society and that governmental interference in this essential unit is something that should only occur in grave circumstances. The right to a mother or father within the family unit is to be defended from unnatural intervention by federal authority, authority that by the doctrine of subsidiarity is only legitimately exercised in certain spheres. Our current willingness to break up the families of citizen children is a massive display of top-down state overreach that conservatives so often decry. Immigration is a complex issue, as evidenced by the failure of Republican and Democratic administrations alike to reach a comprehensive solution for the 11 million people living in this country without documentation. But the personhood of those involved should be the starting point of political inquiry. Republican presidents from Ronald Reagan to George W. Bush understood this. Though one may disagree on the means, these conservative leaders identified and confronted the most vocally racist among their supporters.Today, instead of a relying on a tradition that focuses on limited national oversight, subsidiarity, the relationship between labor and property, and a sensitivity to the trends of local, historical development, I fear that the right is green-lighting the darkest aspects of conservative engagement with immigration policy. I am tempted to think the reason that citizen children and undocumented laborers are not considered in conservative reflections on the common good is that they somehow matter less. Then I wonder how my fellow Americans think of me and the beautiful culture and family values that have shaped me as a Catholic, a conservative and a citizen. Thank you for your article. I enjoyed reading it. I hope it starts an honest debate on immigration and racism. Neither side has been honest in this. There is more of an attempt to score political points as opposed to solutions. The reaction to President Trump by most is disingenuous at best. I say this as a person who did not support his candidacy but have been evaluating what he has done sinc elected. I have observed the positive as well as negative reactions and their merit or lack of it. People are not willing to have a rational discussion on him or his policies. So I hope your article will help change that here on the America web site. An additional comment. I find people react more to culture than to race. This is never explored here and the term "race" or "racist" is commonly use as the pejorative of choice when what the person may be reacting to is a difference of culture. This is common all over the world and not specifically to the United States or any region of the world. When I was growing up there was a negative reaction to people with Southern accents and there were negative reactions in the South to those in the north when I lived there. Within my current area of the world, people use to react negatively to people with Bronx accents with the implication they were not as educated. There is also reactions on this website to people with different views on religion and politics which generate negative stereotypes. I really appreciate the thoughtful and civil tone in your comment. I want to pick up on your point about "race" or "racist" as the "pejorative of choice." I think sometimes conversations about race and racism often get derailed because people hear something or someone called out as "racist" and think of it as merely pejorative (and certainly those words are sometimes used that way). I have found it more productive, when I hear that something I have said or agreed with is racist, to get past my feeling of having been personally offended and examine how that may be true. I also agree that there is widespread intercultural misunderstanding and distrust in the world, and that this is something that all people of good will can work against. But I think it's still worth talking about race specifically. In part, because law and culture have often enshrined discriminatory practices based on collective (mis)understandings about race specifically. If I have failed to understand your comment, please feel free to correct me. You should be precise because justice or corrections can only be done on specific wrongs. I bring up culture because it is one distinguishing characteristic that people react to. But it is more general than that. Built into the human being is an "us vs them" tendency. For example, in graduate school we were exposed to a study that took a homogeneous group and arbitrarily separated them into sub groups and had each sub group do activities in view of the others but far enough apart to not know exactly what was happening. Within a short time each group developed a bonding with each other and a hostility toward the other groups. If there was then an exchange of one or two people between the groups, the hostility disappeared. This is what we see played out on a bigger scale in any place humans are present. It has nothing to do with the United States or any particular racial combination. It apparently is true for some animals as well. We are taught to overcome these prejudices but they are real and operate every day and instead of accusations we should be aware of this built in tendency. I definitely see it here on America as there is a built in hostility to people advocating different points of view. I have witnessed hundreds of personal attacks here over the last 10 years. An additional comment: In the history of the United States there has been frequent hostilities toward different ethnic/cultural groups that were caucasians. There is the frequently mentioned one here of the Irish who were hated when they came in large numbers after the famine. One of the most infamous ones was the hostility toward the Germans during World War I.
as I'm and Eden-American, is there a place for me? Or I could choose another time in history as to some of my relatives... perhaps, Germany? Morocco? Sudan? Actually, why should I 'pigeon hole' myself and my life? How about I am a loved child of God... Yea, that works best for me. I'm an Independent voter who would be fine with a Republican President. To date, Donald Trump has spoken and tweeted disgraceful insults in a manner never seen, especially by a POTUS. How many of his statements would be worthy of study in any of our parochial schools K-University? Has any previous POTUS been praised by the likes of a KKK leader such as David Duke? Donald's disgrace is in clear view for all to witness, and still, some on this stream say he isn't being given a chance for success. Donald Trump has brought this disgrace on himself. I saw it all through the campaign and now, even worse. Even so, my pastor urged us to vote for him in November '16. I'll follow my own path. Donald Trump is a disgrace. Well done...perhaps the author will find time to write again. Over a 40 year period I was a registered Democrat, then a Republican, and now I am an Independent. I voted for both Democratic and Republican Presidents and that includes voting for Bill Clinton twice. However, I did not vote for Obama but thought he might be a good president. Unfortunately, that did not happen in my opinion. I did not vote for either Clinton or Trump and was surprised he was elected as every poll and pundit had Hilary by a landslide. As to this article. I liked it a lot. I don't believe in open borders but do believe that the 11 million immigrants who entered the U.S. illegally should be given a path to citizenship as part of a boarder immigration policy that would also include effective border security. What we don't need is a border where another 11 million immigrants can enter the U.S. illegally and think they can eventually become citizens. On the other hand, I do think that the number of immigrants that are allowed to enter the U.S. each year should be "significantly increased". We should condemn racism in all its forms by our voices and actions. However, Trump did not cause the problems we have, nor will he be the one to resolve them completely. We need Congress and every citizen to do there job, and that means stopping the polarized politics and hate speech. Rather than focusing on the hate speech and violence we have seen recently, we should all take a big pause and give both the President and Congress a chance to implement the issues we all care about. In other words: needed tax reform, comprehensive immigration, better national security, more job creation at every level, and our failing infra-structure. I don't think anyone likes the rhetoric of Trump but I also dislike the destroy Trump media with its half truths, misinformation and over-the-top commentary. If we don't think this is a problem, then we are blind. Nevertheless, I don't believe Trump is evil, a bigot or racist as the democrats and the media portray him. Nor do I think those that have experienced discrimination should blame Trump because Congress and past Presidents failed to resolve this problem. Let's put our energies into creating one voice that demands that the polarized politics of Washington come to an end, and start calling out each political party and politician for their disingenuous promises and ad hominem arguments. This will take time, but bashing Trump for every tweet, every mis-step and Congressional faIlure to do the people's business, in particular solving our immigration problems, is not the answer. process. I Wonder why he interrupted his Major concern over North Korea's action to talk about two groups demonstrating in Virginia. Important yes but where should his priority be? I have experienced presidents going back to Truman and have find decisions made by all difficult to accept but keep in mind the total picture . On conservatism I can say it is still the best approach for all citizens. Do not loose faith in the system that emphasizes the worth of the individual and concern for each other. As president JFK stated government is is not the answer it is the problem . Keep the faith in your country. Democracy is not easy. But the alternatives are not good. And do not forget we are all children of immigrants. God Bless All. This "nostalgic and a-historic view of the civil war" ,as you say, Ashleen, is for many southerners a very real narrative. People ,all people, have a right to their historic narrative. As you do yours. There WAS a cultural clash between the north and south. You had the Puritan and Dutch culture of the north who believed in the ethos of hard word and getting rich. If you were rich you must be good as it was a sign of favor by God. It still exists today among some Christians. And the north still has that reputation of the place people with drives go to get rich .and the south as a more laid back lifestyle. In the hard driving Puritan north Life is about pleasing God through hard work and success ;material success, wealth, capitalism was born and flourished among such beliefs. [Its not a coincidence therefore that France supported the Confederacy and the "mad dogs and Englishman" supported the work till- you- drop- if- you're- rich- you- must be good , capitalist north].lol. This was in contrast to the south who were more like Mexican people with their 2 hour siestas; their life was not about money and work till you drop. The slaves did the work in the fields, as evil as that was and when the cotton gin was invented there was not much work for the whites. Virtue was not measured by wealth as it was for northerners. Theirs was therefore a "beaker full of the warm south" joie de vivre lifestyle. Most of the whites were not slave owners and most of them were poor. These southerners felt that the manufacturing northerners were persecuting them by charging them high prices for the manufactured goods they produced from southern raw materials. They felt harassed and cheated by these capitalist Puritans. Much like the industrialized rich "global north" today, exploiting the raw materials and people of the "global south"; capitalism as a pyramid scheme. Slavery was not un Constitutional; it did not violate the law of the land and presidents had owned slaves. The economy of the north depended on the agriculture of the south. The northerners made a lot of money off of slavery; more then most poor white southerners did. More then the economy of the south benefitted. There was no cotton that needed picking up north so of course they did not need slaves. But the north did have some slaves. The south could have been expelled by the Union precisely for having slaves but they did not expel the south as the north benefitted from the slavery of the south. The ship owners who transported Africans to the new world were in Boston. The northerners were the financiers. The Federal government could have made it Un Constitutional at any time but it did not. When Dred Scott. an slaved man in the south traveled with his "master" to the "free" north he refused as a man in a free state to return south .The US Supreme Court ruled that he must return as he was the white mans property! This was US policy, not southern policy. Both northerners and southerners were white supremacists at that time. And even later as exemplified by Jim Crow southern laws and northern de facto segregation and discrimination. [That's why a civil rights movement was needed a hundred years late]. Though slavery was a moral issue from the get go for most people, including Lee . It would have been abolished without the war as it had been in most countries in the new world without a civil war. The north went to war with the south because the south seceded, NOT because they had slaves. Abolition was the end RESULT of the war, cessession by the south and the issue of slave expansion in the west was the cause of the war. The north needed the south more then the south needed the north. Northernerns were engaged in slave trading in places like Boston and New York where northerners became millionaires from trading in slaves! Beautiful buildings and homes in the north exist as a result of their slave trading.So though it' s easy to now talk about that war as if it were about the noble north against the slave holding racist south is a false misleading narrative. Slavery was an American institution as it was not unconstitutional and the north was in a symbiotic economic relation with the slave states. Symbiotic, but the north benefitted more then most poor southern whites ever did. The north got rich over the south. The racist north returned escaped enslaved people back to the south, as policy. That is why an 'underground railroad" was necessary. So southerners have the right to their [cultural]identity, which for them was different then that of northerners. They felt persecuted by these hyper capitalist greedy northerners. That's why Lee chose to side with his state; all politics is local. Like Washington and most founding fathers who identified with their colony, Virginia more then their country England . Like we have sanctuary cities who violate federal law because it conflicts with their values. So this totalizing good vs. evil where the southerners are all racists and the northerners are not and fought to free slaves denies the southerners their story .Both sides benefitted from slavery and both sides were white supremacists [ except perhaps the northern Quakers]. And it was not unconstitutional, it was an American institution. The conflict was a Cain and Abel, country mouse vs. city mouse story as much as it was about the fact the south had slaves and the north did not. [ they had some too]. The south seceded and war followed that. Whatever happened to ; "with malice towards none and charity towards all", expressed by Lincoln after the war? Let the southerners their identity and their narrative, let the northerners theirs .Let the localities have meetings to determine the place of historic commemorations. Yes let's have a discussion about the civil war and racism .But to just vilify the south in the US 's slave history of racism, and the civil war, is to scapegoat the south and white wash the role of the north in its complicity with Americas history of slavery and racism. It's easy to jump on the band wagon against the south who lost and who had people enslaved. But truth be told it was an American institution which the north partook of and white supremacy was not confined to the south. The south DID have an identity that differed from northerners. And a horrific war occurred and people suffered and to dismiss this history except to denigrate southerners is what is a- historical and knee jerkish. I know your article Ashleen, was not about this and everything else you said is right on, but I wanted to responded to that comment as its a meme that must be repeated by anyone who opposes racism. It's possible to respect the southern history identity and narrative, AND recognize the inherent evil of slavery and racism of the slave holding south. If we do this automatically in regards to Washington and many slave owning and blatantly white supremacist founding fathers, we can do this about the southern secessionists. This article also appeared in print, under the headline "I’m a conservative Latina. Is there a place for me in Trump’s Republican Party after Charlottesville?," in the September 18, 2017 issue. Ashleen Menchaca-Bagnulo is an assistant professor of political science at Texas State University in San Marcos, Tex. She received her Ph.D. in political science from the University of Notre Dame.